Stop what you’re doing, there’s a vegan-friendly ‘Ferrero Rocher’ available to buy in the UK and they look incredible. 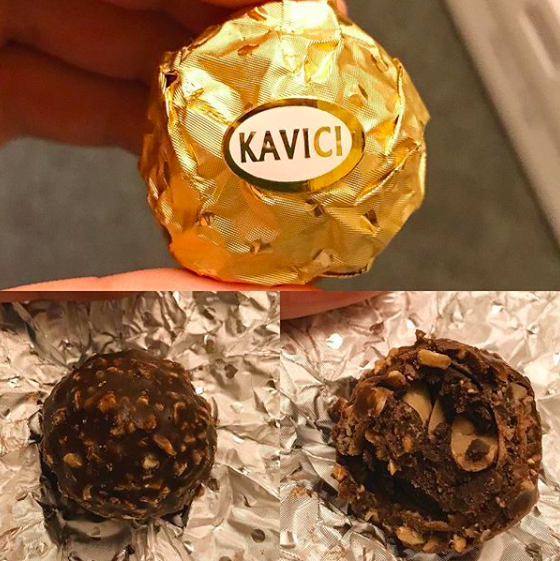 Ok, so they’re not actually made by Ferrero, they’re called Kavici Choco Spheres and whoever found these and put them out on the internet, thank you. To top off this fantastic news, they’re a huge bargain as you can get your hands on a box from Poundstretcher, which means they cost just one English pound. They do fall into what’s known as the ‘accidental vegan’ category as boxes don’t specifically say ‘suitable for vegans’, but all the ingredients are vegan friendly. The full list of ingredients? Sugar, cocoa powder, cocoa mass, cocoa butter substitute, nut, wheat flour, salt, peanuts, soya, wheat and gluten. According to Vegan Food UK, Ruby Miranda was one of the first to spot the chocolates and she was amazed by the price and taste. I’m always pleased to see accidentally vegan products popping up. 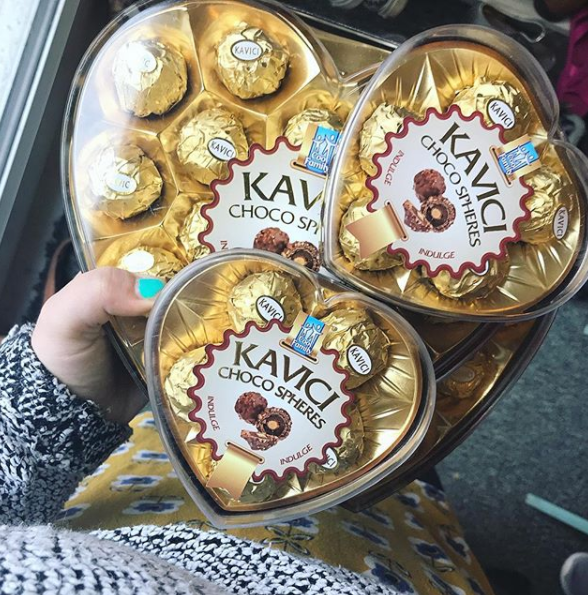 These mock Ferrero Rochers are a great vegan alternative and they’re so cheap! They taste amazing, pretty similar to what I remember the non-vegan version tasting like. More and more stores and companies are extending their vegan options as people look to explore a meat and dairy-free diet. The vegan diet not only steers clear of meat, seafood and dairy – but foods produced using animals, such as honey, some wine, beer and cider, filtered using animal products. Cult ice cream brand Ben & Jerry’s launched dairy-free versions of some classics for vegans and those who are lactose intolerant. Two of the options are Chunky Monkey and Chocolate Fudge Brownie, and there is a dairy-free exclusive, Peanut Butter & Cookies. Delicious. Chunky Monkey is banana ice cream with chocolate chunks and walnuts, Chocolate Fudge Brownie is a chocolate combination of ice cream and brownies and new kid on the block Peanut Butter & Cookies is vanilla ice cream with chocolate cookies and peanut butter swirls. On the drinks side of things, Baileys has also released a fully-vegan, almond milk-based version of their drink – named, Baileys Almande. The drink’s made with almond milk, almond essence, cane sugar, purified water, real vanilla and contains no animal products, making it perfect for vegans. You can also now easily get hold of dairy substitutes in places like Starbucks and Costa – with almond milk, soya, coconut and oat milk accessible. McDonald’s trialled its first ever vegan burger, the McVegan at a restaurant in Tampere, Finland. The McVegan is made up of a soy-based burger patty in a bun with all the standard McDonald’s fillings – tomato, salad, pickles and comes complete with a vegan McFeast sauce. And Pret A Manger has ‘Veggie Pret’ stores in London, which offer vegan and vegetarian food exclusively. A vegan diet has been proven to be healthier, which is one of the reasons people choose to go down that route. Whatever you choose to eat, it’s nice to see options extending for people who do want to eat vegan. NEWS Introducing the first ever vegan Ferrero Rocher!